I just don’t see them in my cryptozoological encyclopaedia. Maybe Flash Gordon can lend us some insight? No? Hawkman? No? Batman? What? He doesn’t do the bat-poop bombardment thing? What about Man-Bat? Oh. His wings are attached… humph! So where can I take a peek at Rocketman, so I can see his #1 issue major baddie comparison? Wow, that’s bad. Stop laughing! I’m not making this up! Really! See? I have charts to prove it! Its a Tengu, a creature from Japanese lore. 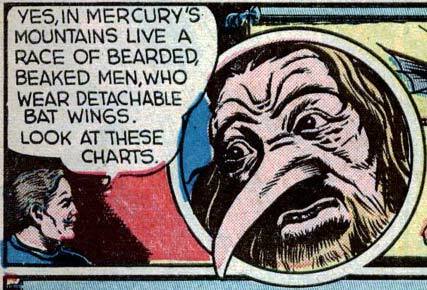 My first thought was Tengu as well, but weren’t Tengu Crow-men, not Bat-men? EnderX same guanno different pile. I love the non-sequitur. “There are beaked men. Look at these charts!” WTH?